View More In Decoys - Page 7. Add a little variety to duck hunting with the Over-Size Series Diver Combo Decoys, 6-Pack from Greenhead Gear. Packed six to a box, these realistic 3-D drake decoys feature polyethylene plastic construction to help withstand frequent hunting trips. A natural appearance helps the drakes attract real ducks to your location. 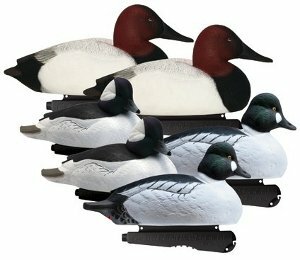 Includes two canvasback, two goldeneye and two bufflehead decoys. No assembly required! Canvasback dimensions: 16.5in long x 7.5in wide; Weight: 29.1 oz. Goldeneye dimensions: 15.5in long x 7.75in wide; Weight: 28.9 oz. Bufflehead dimensions: 12.5in long x 6.75in wide; Weight: 16.3 oz.